I love all the elaborate rainbow surprise cake desserts, darling decorations, and detailed crafts that fill up Pinterest. The reality though is I’m often short on time and I’m not going to be able to create all those things for each holiday. 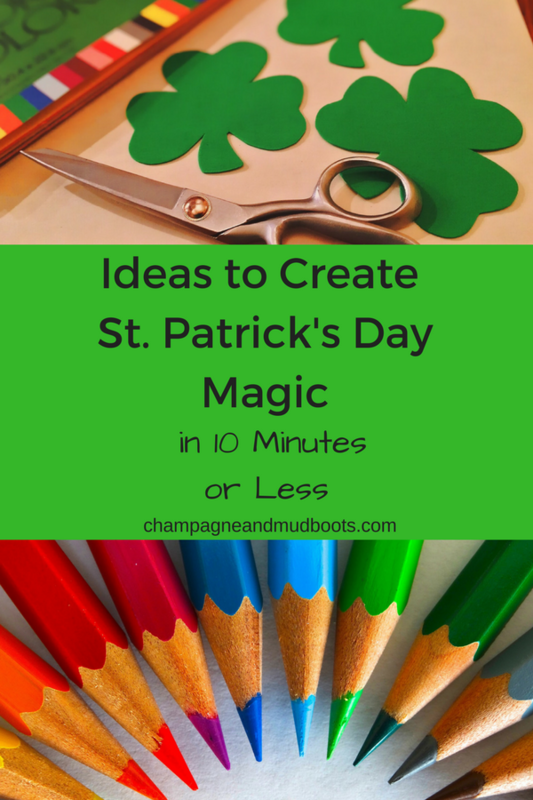 I don’t want to miss out on the fun though, so in the interest of helping out my fellow time deprived moms I’ve created a list of Easy St. Patrick’s Day Ideas that will help you create Irish Magic in 10 minutes or less! 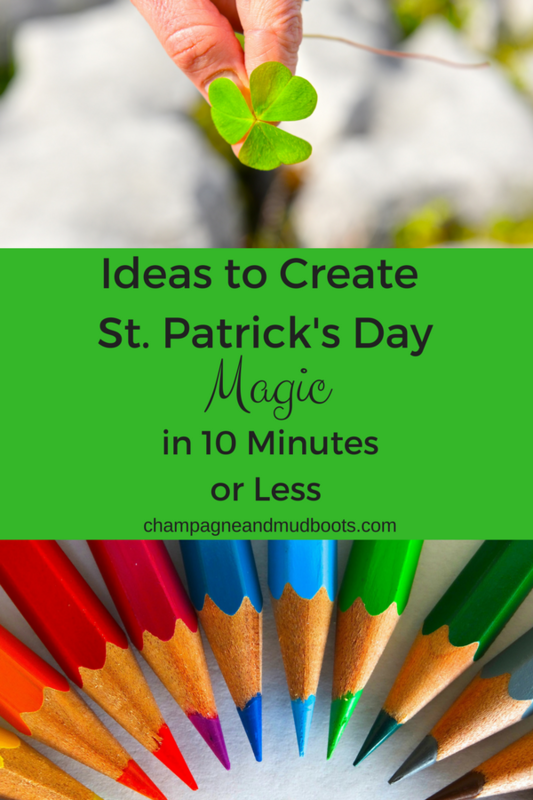 Some of these ideas are super simple requiring zero plan ahead time and others may take a 10 minute set up on the actual St. Patty’s Day but require a little forethought at least at the grocery store. Don’t forget to crank up the Irish music on pandora, Youtube, or Spotify to help set the mood for any of your projects! It’s classic, takes two seconds and automatically makes breakfast more fun! 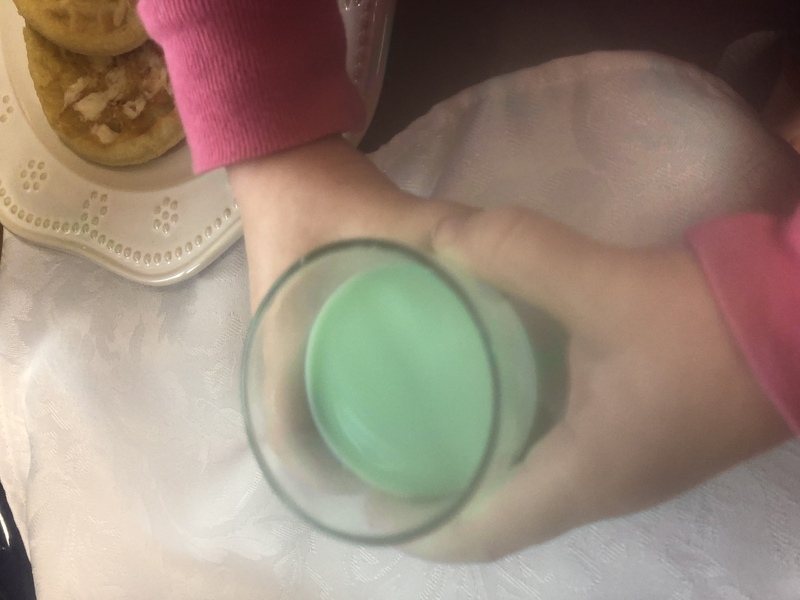 I would highly suggest serving it in juice glasses in case anyone refuses the green milk, then you don’t feel like it’s going to waste or you can sneakily offer to one of the other kids. It can’t be just me that carries rejected food into the kitchen and brings out on new plate to offer another kid as a second helping?!? One of mine was weirded out by the color and wouldn’t drink the milk. I love this idea from Tonya Staab probably because I just love fairies and sprinkles make everything better. Besides the kids love sprinkles! It’s not the healthiest but just don’t eat it everyday. 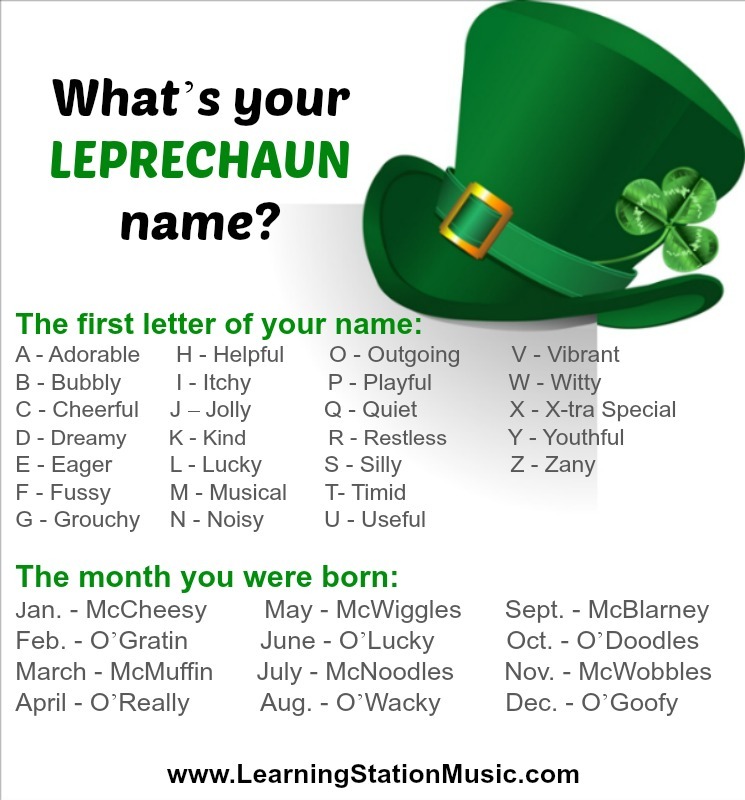 Learning Station Music has this fun idea to come up with your leprechaun name. Kids enjoy seeing what silly names are created and it could be a fun addition for mealtime conversation. 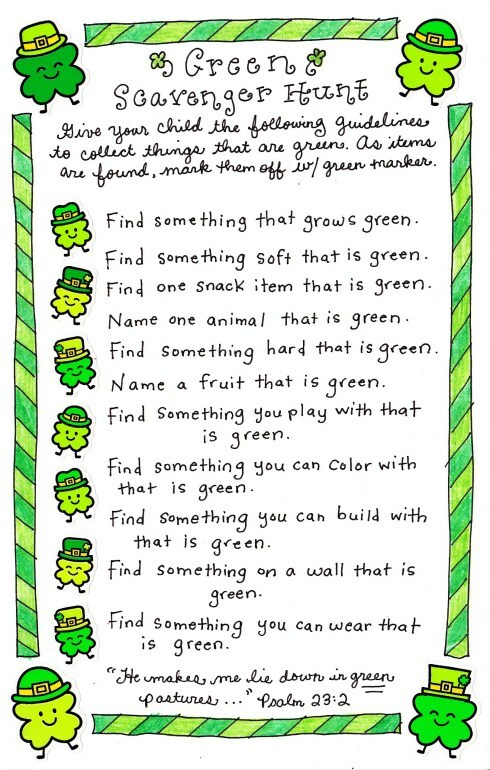 Put the kids to work with a green scavenger distraction from the Happy Home Fairy. 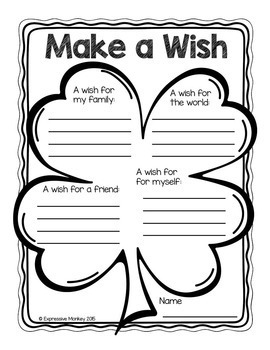 Print one out and enjoy your coffee while they run around like leprechauns! 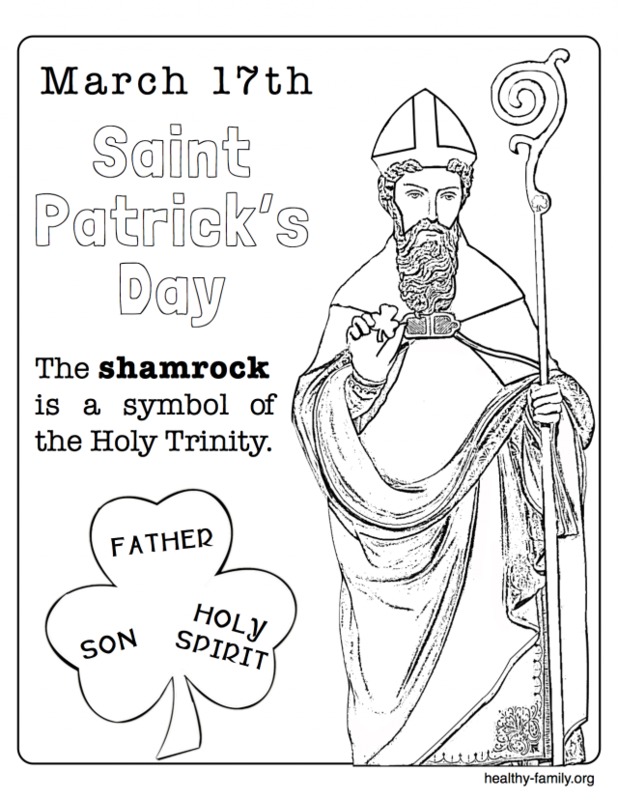 Print out this page from Healthy-Family on St. Patrick and his Holy Trinity Shamrock for a quick history lesson. Get to know your kids just a little bit better with this freebie printout from Teachers Pay Teachers is super fast to access and even if you fill out the answers for your kids it is a fun keepsake to look back on. 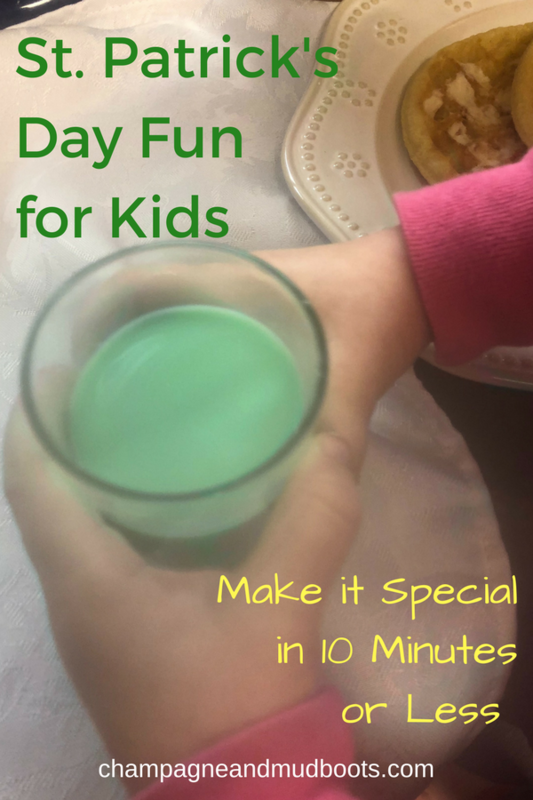 This is another one that can add to mealtime conversation or be done separately with each kid to create a little extra one on one time. Print out these jokes from Frugal Fritzie to add some fast fun to lunchboxes or even to have at each kids place setting at home! Quick and simple yet adds a little something extra to the day. 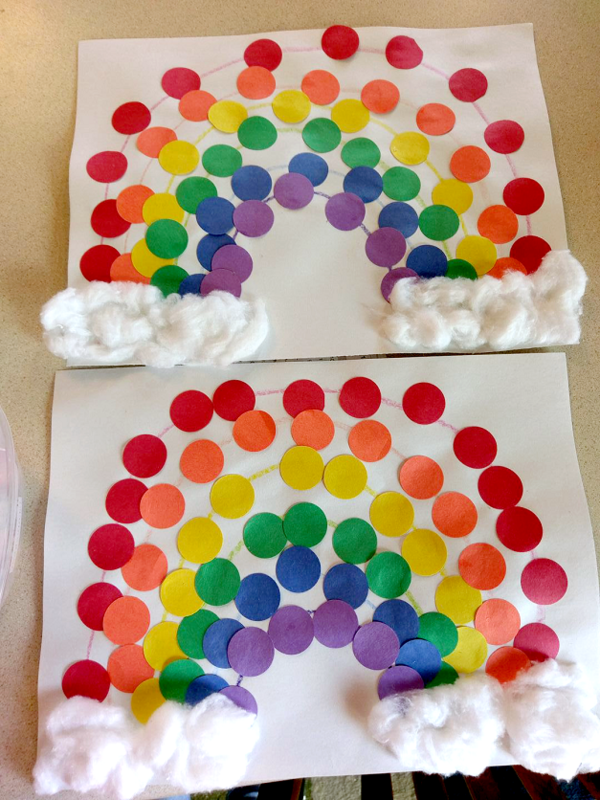 Crafty Morning has this cute rainbow project with dots. I would probably simplify it by using the do-a-dot markers to make dots rather than cutting out all the circles but if you have a large hole punch you can make the circles pretty quickly. You could also have kids just tear or cut pieces of colored paper to glue onto the picture for a more mosaic style rainbow that works on additional fine motor skills. 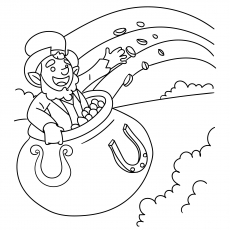 Good ol’ Crayola has this leprechaun face as a free printable for kids to create their own leprechaun. 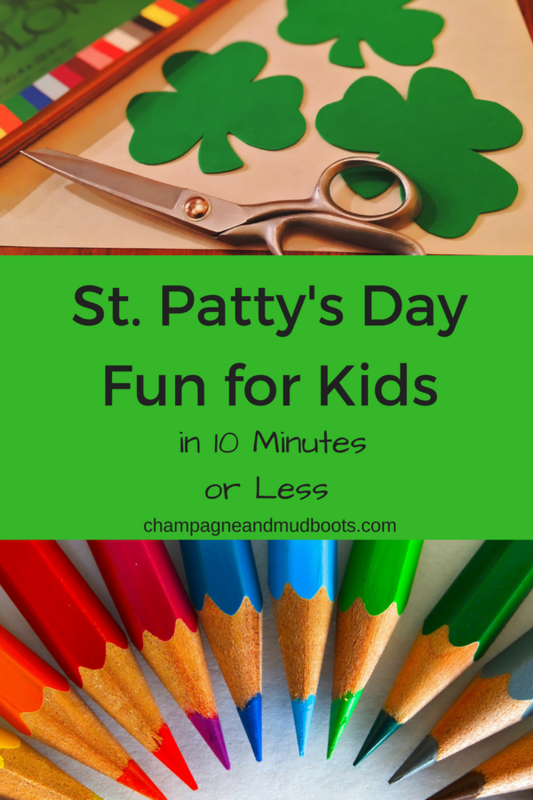 Mom Junction has multiple St.Patty’s Day printouts for kids to color. There are very simple drawings. and more elaborate printouts. No need to leave the coloring just to the kids. 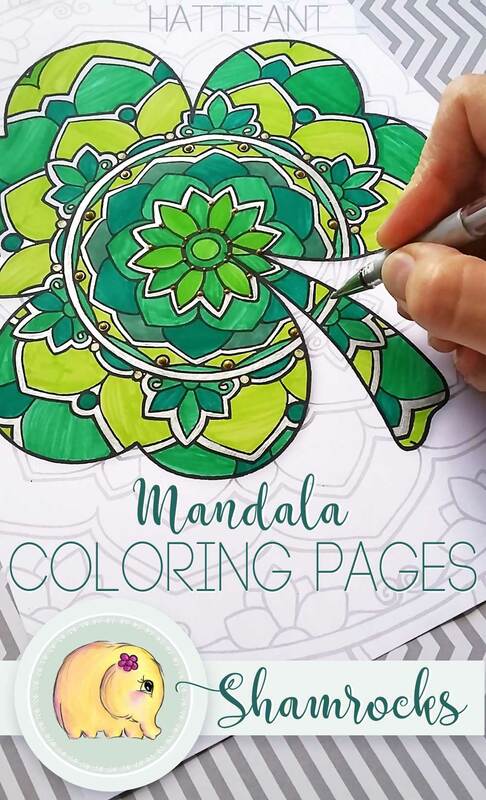 Print off one of these mandala shamrock pages from Hattifant and join in on the fun. 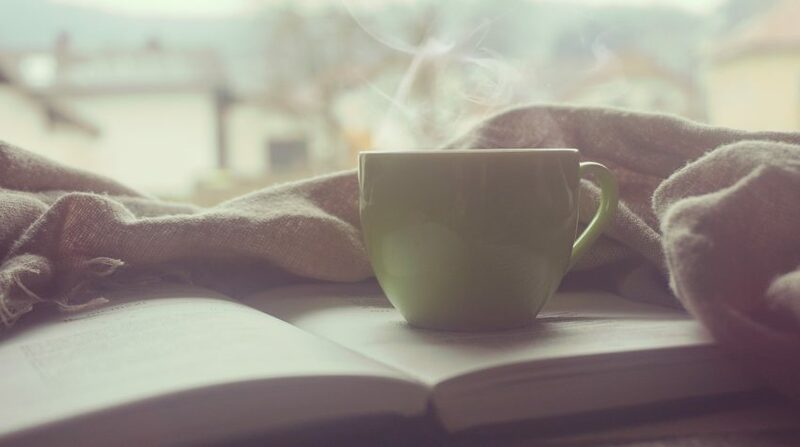 Even if just for a few minutes, the relaxation from coloring and temporarily having the kids occupied with their sheets, can allow your brain time to relax. 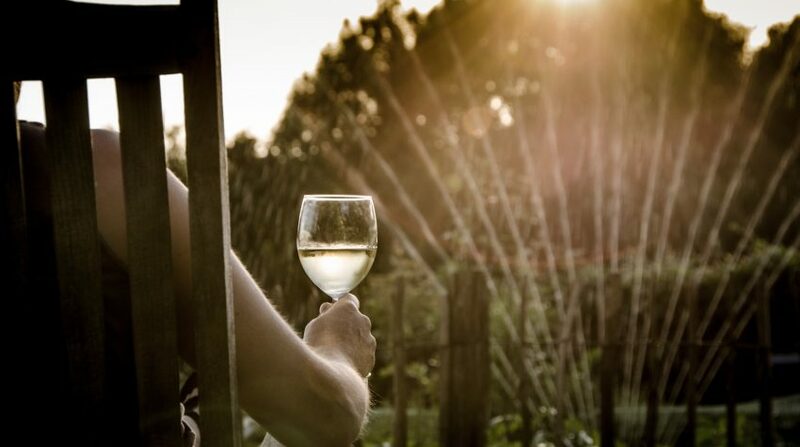 Relaxation and recharging are two things that are seriously lacking in most of our lives! 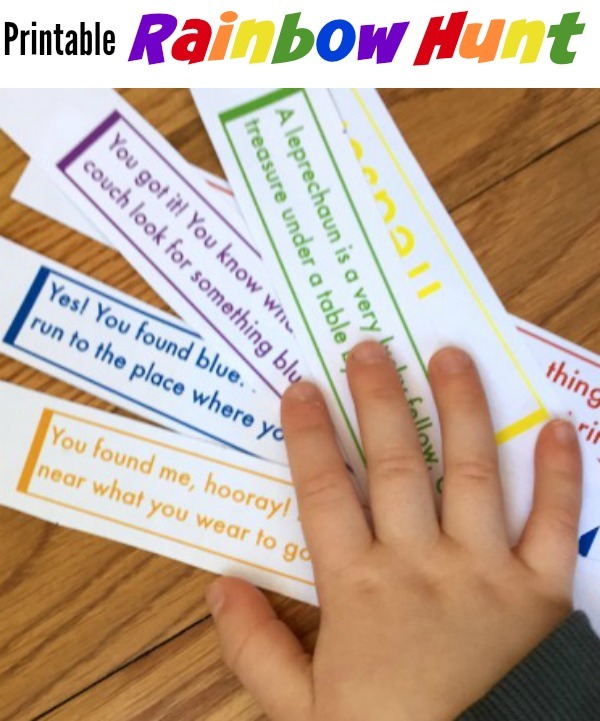 Simple Play Ideas has this ready made scavenger hunt that you can print, cut, and hide within minutes. The real trick is just choosing what treasure you want to hide. 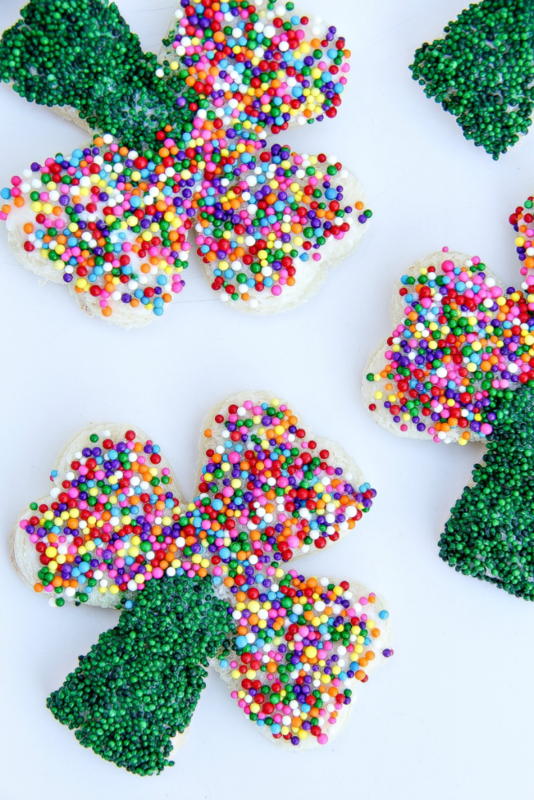 You could try some of the following fun St.Patty’s snacks as an end of the rainbow surprise! Well Plated cooked up this rainbow pizza. They used a crescent roll dough but you could even go with a sugar cookie base if you wanted to sweeten things up for a dessert. You can also sub green grapes for the kiwi if your kids aren’t into kiwis. 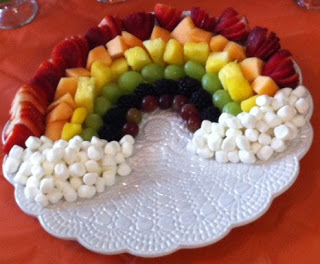 Fruit is more fun in designs and this rainbow from Rainbow Birthday Party doesn’t disappoint. You could substitute a yogurt dip for the marshmallows as the clouds. It’s guaranteed that in my house the marshmallows would disappear before any fruit! 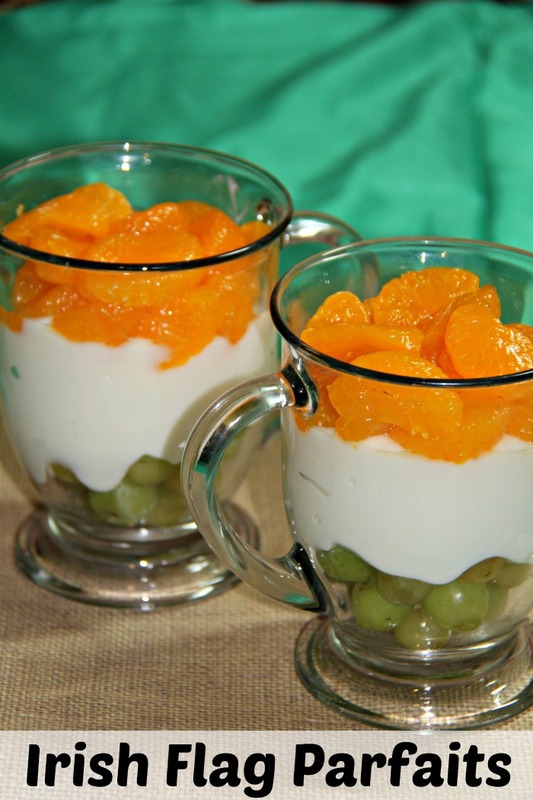 Layer grapes, whipped cream, and oranges for a yummy afternoon snack like these pictured from Spring Mount 6 Pack. If your kids are like mine they adore almost anything topped with whipped cream. 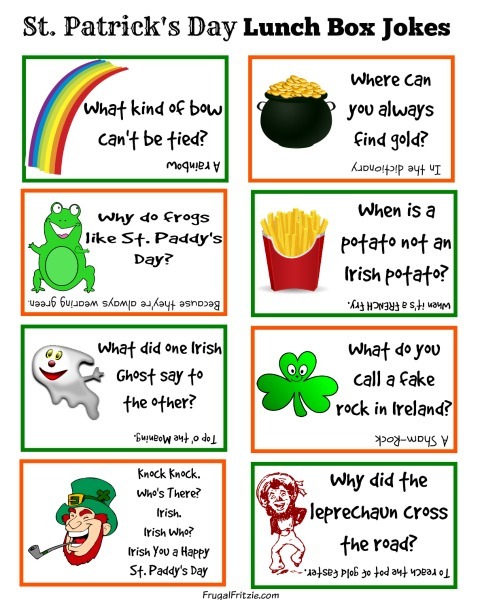 Bren did created a printable St. Patty’s Day joke teller. 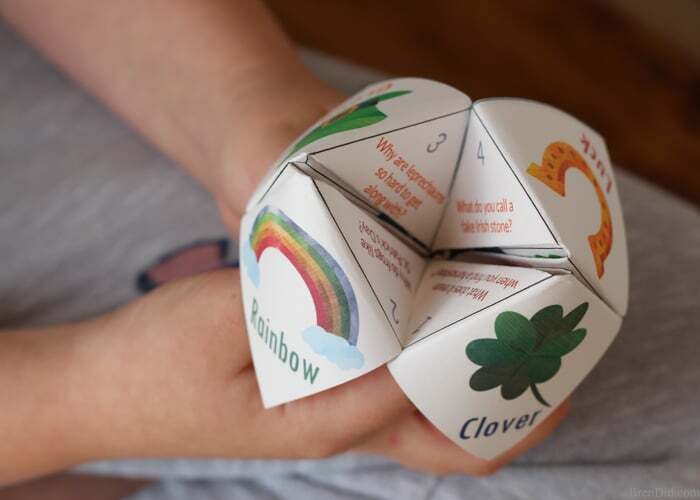 Kids can have fun opening the flaps and telling jokes to each other. 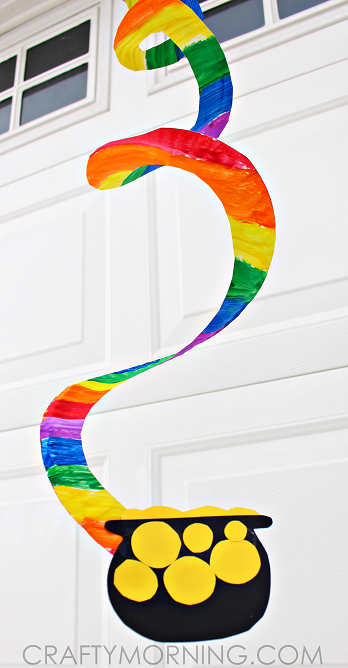 Crafty Morning has a fun Rainbow Twirler from a paper plate that is especially good for older kids that they can hang in their rooms. It could be done for any age but the older kids can be more independent with this craft. You probably have all the supplies you need already at your home for these sun catchers by There’s Just One Mommy. 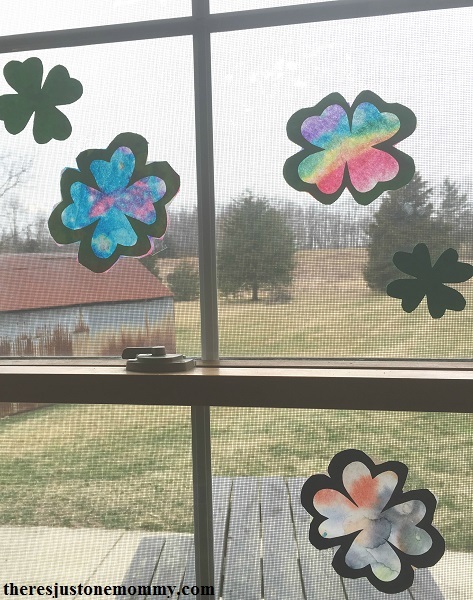 Coffee filters, construction paper and water colors create pretty sun catchers that older kids can do by themselves and only require a little help for the littles. If you have paper plates handy kids can create this rainbow pot of gold decoration. You can just sub yellow construction paper for the coins. I find it always a challenge to get new foods into my kids, especially one of them! 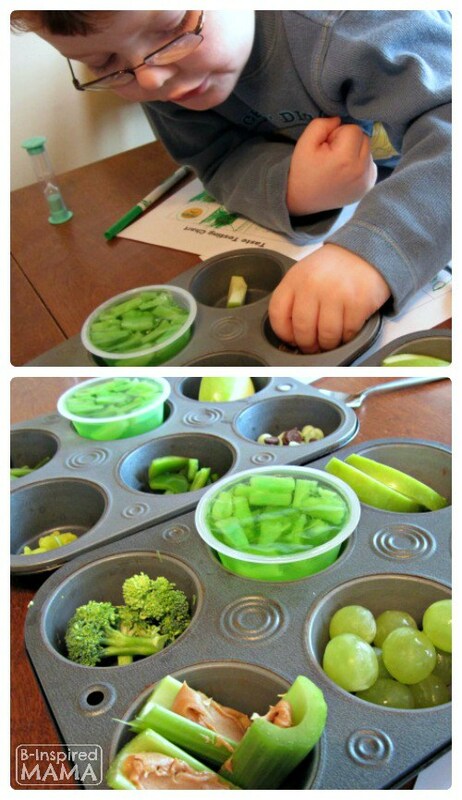 B-Inspired Mama created this green food tray provides a low stress way to encourage a variety of foods. 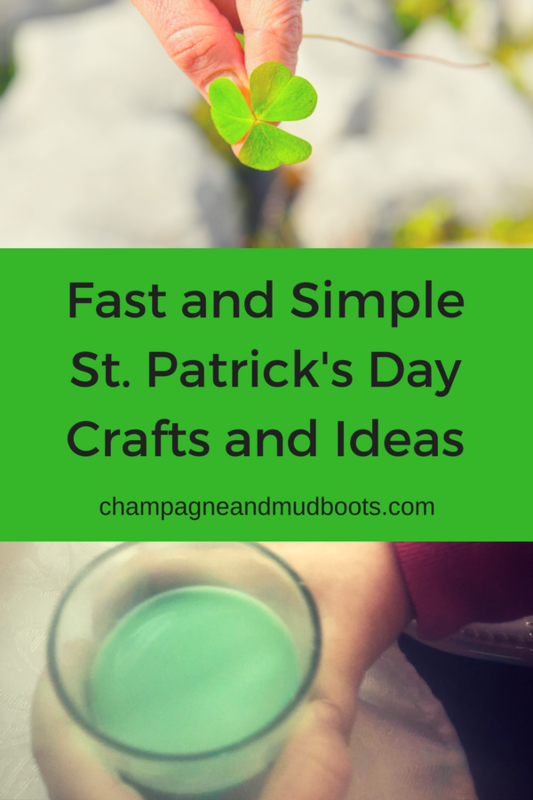 Use at least 1-2 pieces that you know your child will like and then you can experiment with the rest of it. These can be a variety of fruit, vegetables and sweets. Any leftover fruit and veggies can be stored for later in the week. 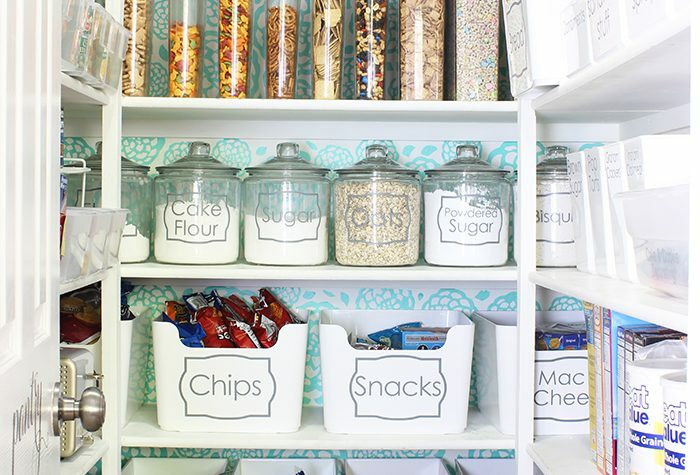 This printable already has a taste test sheet that allows kids to rank the foods. Putting them in charge fosters indepedence but also helps to encourage trying the food since they get to rank it. 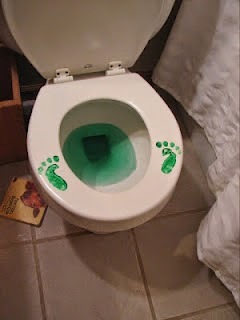 The ubiquitous green foot print made from a handprint and green water delights boys and girls alike. Growing a Jeweled Rose has a great example you can set it up very quickly at night and kids can find it in the morning. 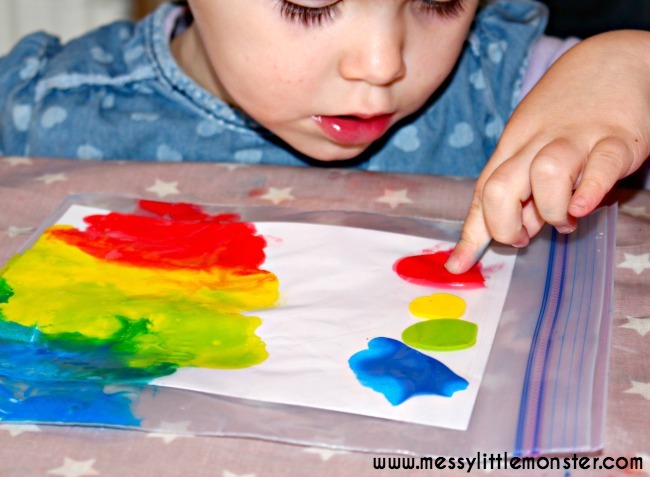 Messy Little Monster has a fun no mess activity that lets your littles explore the rainbow without the messy clean up afterward. You don’t even have to put in the paper but just let them explore the paint inside the bag. Just don’t forget to tape it up if you think your kid might open it and you want this as a distraction to be able to cook dinner. 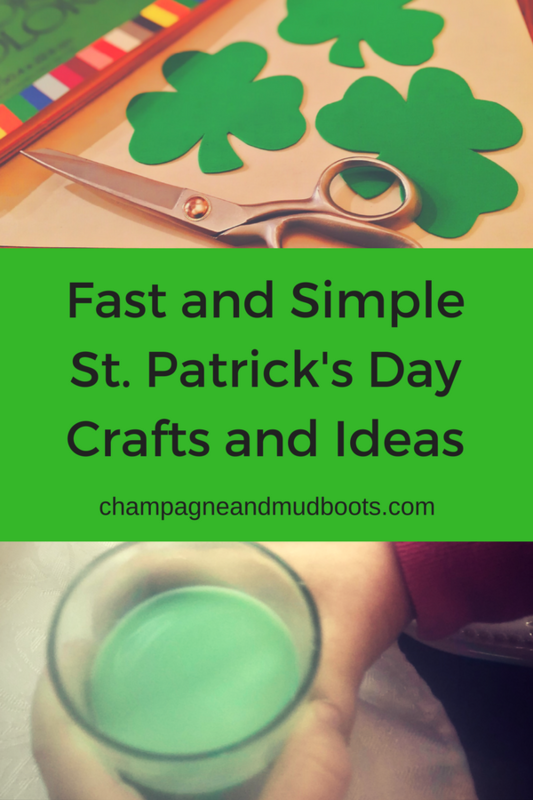 Have a wonderful St. Patty’s Day and remember the kids are just as happy if not more so with a relaxed mama and a simple craft to a stressed out mom with a perfect leprechaun trap!